When I Was Naked by Timothy P. Schmalz is a masterful piece of Christian sculpture that will create an instant conversation piece in any home decor setting. 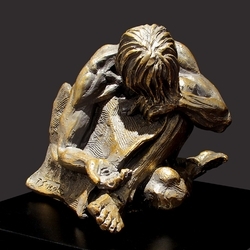 In this piece Christ is portrayed as a homeless man naked and clinging to a piece of cardboard to keep him warm. Based on Matthew 25, “When I was Naked” confronts our prejudices against the impoverished and compels us to look deeper for a glimpse of the divinity and dignity within them. This solid resin-stone cast is coated in a realistic bronze finish and is mounted on a solid matt black base. Timothy personally sculpts every original small masterpiece complete with his signature or monogram. Each replica is detailed by hand to the exacting standards of this modern day master sculptor.